Select WalMart stores now carry a line of cloth diapers called mabu baby. 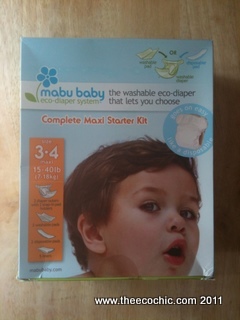 The team at mabu baby was nice enough to send me a few of their products to review and test on Lil’ B. When the box came I was quite impressed with the contents and the different options that they have available. Most parents who will find the mabu baby line will probably stumble upon them at the actual store so looks and packaging is very important. and the size range is for 15-40lbs. That’s actually a pretty good size range for someone who may have stumbled across these diapers at WalMart. It would certainly intrigue me to give them a try. Honestly it’s not much different than stumbling across a package of gDiapers at your local natural food store. This system gives parents the option to try a hybrid diapering system with both a reusable option and a disposable option. What it offers you however is a more affordable option than gDiapers. Also – more people shop at WalMart than natural food stores. They certainly have the market but how will people respond to them once they get them home and how well do they work? 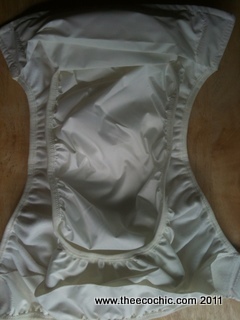 The Maxi cover seen in the picture is for toddlers 15-40lb. 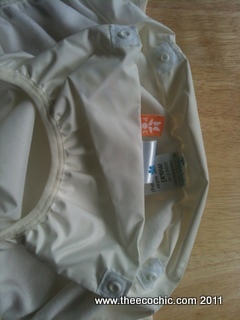 It has a simple hook & loop closure that reminds me of the old GroBaby (the old version of GroVia) aplix. It’s a very fine aplix that attaches to a very soft section across the front. 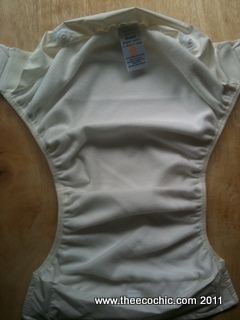 There is a small laundry tab that uses the same ultra soft fabric that goes along the front of the shell. The laundry tabs are smaller than the actual aplix. The shell is made of 100% recycled polyester and is lined with a 100% recycled polyester fleece that is very soft (backed with PUL). 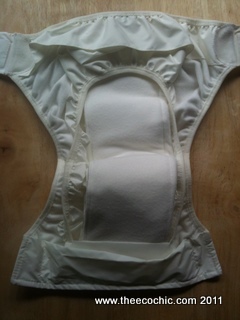 Along the inside of the front/back of the diaper the polyester outer material is used to create a flap that hides the snaps for the snap-in pad holder. My thoughts: I like the softness and the fine aplix but it’s not very strong. When washed I ended up with the dreaded diaper chain. The diaper doesn’t have a cross over closure either so if you have a small waisted baby you may need to go with a smaller size. Inside of the Maxi Cover. 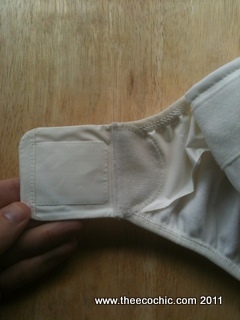 Inside of Maxi Cover with Snap-In Pad Holder. You could easily reuse the outer shell and simply replace the snap-in pad holder and insert. 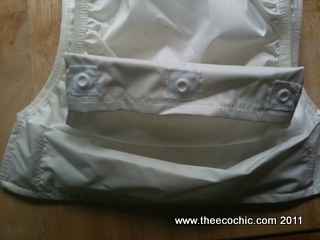 However if the outer shell gets soiled or wet it’s fabric so you’ll need to wash and dry before you can use it again. Snap-In Pad Holder with 3 snaps on the front piece. Simple to use, easy to attach, and the snaps are covered with an additional polyester layer so no snaps will touch your baby. Snap-In Pad Holder has 2 snaps to secure it to the Maxi Cover in the back. Washable cloth pad insert. Stay dry on one side and microfiber on the other. When folded to fit inside the cover you’ll have 4 microfiber layers and 2 stay dry layers. This was plenty of absorbency for our tot at night but an extreme heavy wetter may need one more insert. 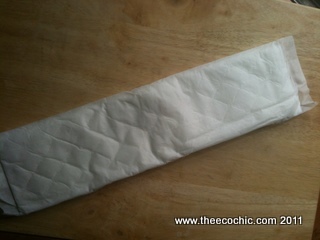 Maxi cover with snap-in pad holder and washable pad in place. The insert was a little long but I was able to fold it over just fine inside the pad holder. Disposable pad. Reminded me of a postpartum mama pad. Very absorbent but needed to be folded to fit my tot. 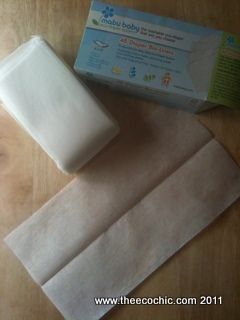 Flushable diaper liners. 5 samples included with the Maxi Starter Kit. Strong enough you could actually wash them once if you wanted to try to get 2 uses out of these. A very poor photo of my tot modeling her mabu baby from behind. She’s 3yrs old and about 25lbs. There is plenty of room to grow in these diapers. I think the Size 2 would have fit her skinny booty better. …but I don’t think it’s suppose to either! The customer of these diapers are hopefully going to be the parents who stumble upon them at WalMart who have never seen a modern cloth diaper. They may have only seen those horrible Gerber prefolds and flats that now reside at most WalMart stores and the plastic pants that accompany those. If this is the customer who finds mabu baby and gives them a try I think it’s a good start. 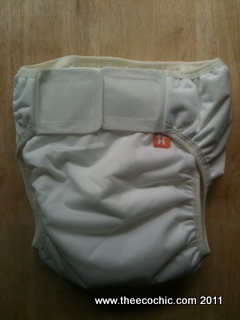 More parents have the opportunity to to learn about modern cloth diapers. More babies will be protected from the nasty chemicals of disposable diapers. More families will have extra income to feed, cloth, and house their children and themselves. Less disposable diapers will end up in our landfills. More families will come online to research cloth diapers…and hopefully finding out just how large the cloth diapering community really is! 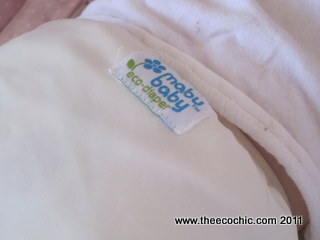 Are you one of those families who found cloth diapers because of mabu baby diapers? I would love to hear your experiences. I know that Target carries bumGenius but only online. I went into a store to work on a Baby Registry (cause I have to register somewhere my family can go physically) and the sales lady had no clue what I was talking about when I asked about the organic clothing and cloth diapers. I wish more stores would be open to not only having the products online but to also having them in the stores where more would stumble upon them and not have to seek them out. While I’m not a supporter or a fan of Walmart (or any chain/box store for that matter) I am glad to see that not only are they willing to carry a cloth diaper but they even went and made their own brand. Thanks Alaina – they didn’t actually make their own brand though. It is an independent label that they are stocking. The points that you made are one of the reasons the cloth diapering community of retailers and manufacturers are nervous about big box stores carrying cloth diapers. Without proper education and awareness parents will still struggle with their choices and many will decide that cloth is not right for them. I have a second post coming about the 5 Reasons I think cloth diapers in big box stores is bad for the community! The only thing that will keep the community growning is education – and the campaign has to be BIG and MAINSTREAM!! I don’t think this option is available at Wal-Mart in Canada yet, so thanks for sharing! I think it’s great that Wal-Mart is helping to introduce modern cloth diapers to the masses. I hope more people will discover how easy it is to use cloth diapers, and I think most people would do a bit of research on-line before they made a big purchase like this. When they research on-line, they’ll probably discover a lot they didn’t know about cloth diapers before! my store had them instock…. I didn’t try them but they look alot like G-diapers. also the cover seems cheaply made, but I’m new to this whole thing so I haven’t tried many diapers I’m not a good judge. I just saw these at my local Walmart today… On clearance! Apparently they didn’t sell so well! I haven’t cloth diapered before, but I’m thinking about it for my 3month old. I found an open box so I checked them out. 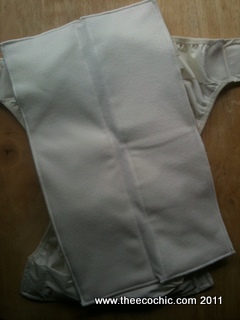 They seemed kind of thin to me, and a little too “plastic-y” for a cloth diaper. I’m still on the fence about getting these to try out, maybe I’ll spend a little more for a more recognized brand. I love how they are packaged though, with both the reusable pad and the disposable ones. My mom picked up a bunch of the cloth mabu baby inserts on clearance at her Walmart for me when I decided to try cloth diapering. I’m 9 weeks in with my little super soaker and these are my favorite inserts. I use a variety of brands of pocket diapers and these fit them all very well and are more absorbent than most of my other inserts. I saw these on major clearance at my Walmart tonight but they didn’t have any of the starter kits, just the pads. I did find one newborn starter kit that appeared to have been opened, used, and returned (gross). Anyway, I bought the pads thinking I MIGHT be able to use them along with our disposable diapers if only just at home. What do you think?